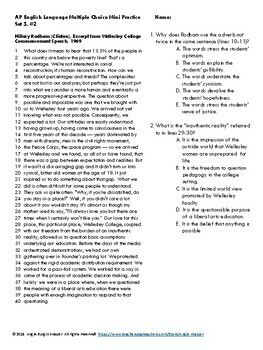 Attack the multiple choice section of the AP Language exam with this set of eleven resources. Ten sets of practice exercises will give students daily practice with strategies for choosing and justifying their answers, and Question Stem Swagger will help them learn all about question design. 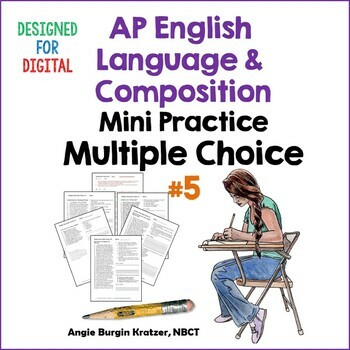 This AP English Language product is made up of five one-page multiple choice exercises using excerpts from essays in the public domain. 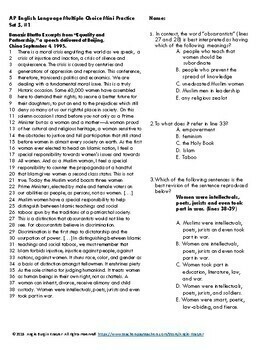 This particular set of exercises uses passages written by Benazir Bhutto, Hillary Rodham (Clinton), Matilda Joslyn Gage (2), and Abraham Lincoln. Stems, foils, and answers are based on the format and rigor of the AP™ English Language & Composition Exam. A detailed answer explanation is provided for each question. Are you new to teaching AP English Language & Composition? If so, watch this 30-second video. The author of this product, Angie Burgin Kratzer, is a veteran English teacher and curriculum specialist with extensive experience writing state-level and district-level formative assessment tools for teachers. Sign up HERE for Angie's EMAIL LIST! Get regular exclusive freebies, announcements, and a little bit of humor. Every time you make a purchase on Teachers Pay Teachers and leave feedback, you earn credit toward a future purchase. How does it work? After logging in, go to My Purchases and find the Provide Feedback button beside each product. Leave a fair rating and a comment about the resource, and you're done!